For a decade the cast of NBC’s Friends presented a unique balance between making us laugh and giving us reasons to cry. Chandler, Ross, Rachel, Monica, Joey, and Phoebe were all likeable, relatable TV characters (maybe with the exception of Phoebe, who is hilarious, nonetheless) who presented a sitcom format that may have kept the comedy on the family couch, but moved that couch to a cozy NYC coffee shop and created the ‘family’ out of a unique group of friends. In 2004, the Friends finale was watched by a whopping 52.46 million viewers. That’s the type of audience large enough to turn a television show into a cultural milestone, and now those viewers can relive Thanksgiving mistakes and partner hopping in high definition on Blu-ray. 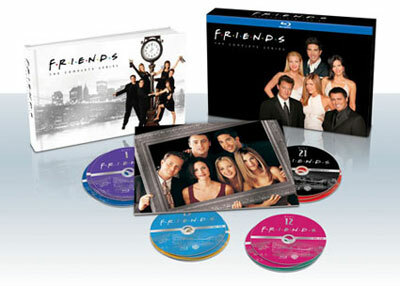 Just a couple of years after Friends ended its epic run on network television, Warner Bros. produced the DVD set Friends: The Complete Series. The set featured extended episodes, episode commentary, featurettes on the set and behind the scenes, gag reels, the full version of “Smelly Cat,” and more. Friends superfans might be unhappy to learn that the extended episodes were not cleaned up for Blu-ray. That’s neither here nor there, because fans who do spring for the brand new Friends: The Complete Series Blu-ray should be happy with the extras, and more than pleased with the quality of the picture. All of the Friends original television broadcast episodes have been cleaned up from the original film and put into 1080p High Definition. Since filming for Friends spanned over a decade, the picture quality from the 2000s episodes was already better than the picture quality from those episodes shot in the mid-nineties. When cleaned up on Blu-ray, you can still tell some of the episodes were filmed nearly a decade apart, but overall the vision is crisp, clear, and astoundingly colorful. I’ve seen the series on DVD, and if picture is something you care about the Friends: The Complete Series Blu-ray hits all the right notes. All of the extras from the DVD have returned, too, and are tucked away and hidden within the discs for each season. If you haven’t caught these, the episode commentaries (for the most part) are the clear winner, especially since the extended episodes are missing from this set. Again, I don’t feel like that is much of a nightmare, especially considering the amount of disc space on Blu-ray I’m assuming the extended episodes would have taken up (the discs are chock full as is). The neat and tidy packaging, with the one big “book” of Blu-rays all cleaned up and put into a beautiful black case with a holographic cover (that shows the cast in 1994 and 2004) is more important to me than the offer of extra minutes of kitschy dialogue. Again, purists are welcome to disagree, but they’ll still be dealing with fuzzy picture. Warner Bros. didn’t simply stop at rehashing the DVD features with this set. The company even went out of its way to put together an episode guide booklet with the series, as well as 3 extra hours of bonus features that are present on the set’s black bonus disc. The big extras are present in the section “True Friends: Documentaries,” which includes three retrospective featurettes that tell the tale of how Friends made it to series, how the writers room developed some of its best plots, and how ending the series had some sad parts (ending the series) as well as some good memories (leaving behind a legacy). All three documentaries were fairly long and went into detail, telling many stories I had never heard before. The experience of watching the documentaries was very similar to the experience I had with reading the book Live From New York. Like SNL, I thought I knew a lot about Friends, but there really is always more to know. Friends has been rehashed in pop culture and played so often in syndication that many of us know the show like it’s the back of our hand. That means we’ve seen the saga of Ross and Rachel’s relationship, and Monica and Chandler’s twin surprise. We know the smarmy charm of Richard, and have been introduced to Regina Phalange. Friends ended nearly eight years ago, and at this point, whether you were a casual fan or a serious fan is moot. The Friends: The Complete Series Blu-ray is for anyone who wants to look at one of the last great comedies to ever instill loyalty in an audience that hit all the way across the boards, coming from different cultural backgrounds and even age groups. If it’s not worth the price point, so be it, but if you give the set a real chance, I doubt it will disappoint.